Cytoarchitectonic Atlas of the Human Cerebral Cortex: In MNI Stereotaxic Space depicts the cellular structure of the human cortex, detailing the arrangement of neuronal cell bodies as well as the relationships between cytoarchitectonic boundaries and anatomical landmarks. 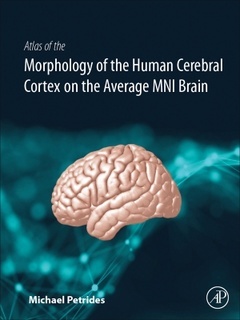 Presentation in MNI Stereotaxic Space enables the atlas to serves as a useful working tool for structural/functional neuroimagers attempting to identify the cytoarchitectonic area within which a functional activation or a structural change has occurred. An introductory section discusses the history and current state of cytoarchitectonic studies, and a separate chapter on methods is also provided. Mapping of the frontal lobe, parietal lobe, insula, temporal lobe, occipital lobe, and white matter fascicule follows. Dr. Petrides is a Professor at the Montreal Neurological Institute, McGill University. He is a Fellow of the Royal Society, the Royal Society of Canada and the American Academy of Arts and Sciences. His research focuses on the neural bases of cognitive processes and involves the analysis of the functions of the frontal, temporal, and parietal neocortex and related subcortical neural structures. His research is also focussed on examination of the sulcal and gyral morphology of the human cerebral cortex and comparative architectonic studies. He has authored numerous journal articles (h-index = 88; i10-index 189) and is the author of The Human Cerebral Cortex (2011), Neuroanatomy of Language Regions of the Brain (2013) as well as co-author of 3 other atlases.